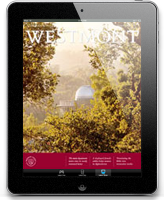 Thanks to the leadership of the Westmont Parents Council and the generosity of current and former parents, students can keep in shape by working out in the new Wiegand Fitness Center. The E. L. Wiegand Foundation of Reno, Nevada, gave the college a $100,000 challenge grant that parents matched by raising about $140,000 to construct the facility and purchase state-of-the-art exercise equipment. Several members of the Parents Council attended the dedication ceremony in March as did Kristen Avansino, president of the E. L. Wiegand Foundation. The Parents Council has taken on a second project and is seeking $111,000 to fund renovations in the residence halls. In addition to installing carpets in all the rooms in Van Kampen, the money raised will allow the college to refurbish a lounge in each of the other dormitories: Page, Clark, Armington, and Everest Halls. Members of the Parents Council have already pledged $55,000 toward the goal. The Class of 1997 decided to dedicate their senior gift to this project and to Patrick Steele ’97 who is recovering from a serious injury to his spinal cord. 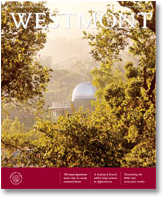 The drive falls under the auspices of the Westmont Fund which provides resources for essential operating expenses such as campus renovation. For more information about the parents and senior campaign, contact Mary Given, director of alumni and parent relations, at (805) 565-6056.